If you’re looking for a heavy-duty walking treadmill, the Exerpeutic TF1000 is definitely one of the best choices that you can make. Not only that it is a high-capacity machine, it is also space-saving and offers great portability. It doesn’t offer online connectivity, nor it is compatible with any online fitness apps, but on the other hand, it’s not an extremely expensive treadmill. It’s a perfect machine for anyone who wants to get in shape. 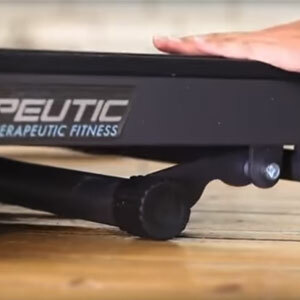 Although the Exerpeutic TF1000 is a walking treadmill featuring a design that can be compared to the Confidence Power Plus, it is definitely a heavy-duty machine; its deck and frame can support users up to 400 lbs (181 kg) which is a huge plus for it. Other more expensive machines, such as the Schwinn 870, actually don’t have this super weight capacity. The unit’s frame is made of steel tubing. The only parts within its construction that are not made of steel, are the side rail covers and the protective cover of the motor. All the steel bars are double coated with a rust-resistant and chip-resistant paint finish. However, despite its durable finish, the machine is for indoor use only. If stored and used outside, moisture or excessive heat may eventually damage both the paint and the internal components. Like many other walking treadmills, this Exerpeutic treadmill is not an extremely large one. With the frame fully set up, it is approx. 51″ (130 cm) long, and 32″ (81 cm) wide. On top of this, Exerpeutic recommends a usage area of at least 79″L x 40″ (200 x 100 cm). But on the other hand, the unit has a folding design. The deck can be folded up and connected to the console masts; with the deck folded up, the unit’s length is reduced to approx. 1/3. The machine’s folding mechanism integrates a hydraulic cylinder which assists you with folding and unfolding the deck. However, the deck itself is not extremely heavy. If you can lift at least 40 lbs you should be able to fold and unfold it without any trouble. Also, in case you’re wondering, the net weight of the machine is approx. 120 lbs (54 kg). But its front base integrates a set of wheels which improve its portability. The treadmill is equipped with a heavy-duty, high-traction belt, which offers a walking platform of 40″L x 20″W (101 x 51 cm). This should be more than enough for users up to 6’5″ (196 cm) for walking workouts. The belt is set into motion by two crowned rollers which integrate industrial-quality ball bearings for a smooth operation of the belt and a long lifespan. Last but not least, this Exerpeutic treadmill is equipped with a set of extra long sidebars. They’re 18″ (~46 cm) long, which is almost twice the standard length. They incorporate pulse sensors so that the computer unit can read your pulse. Also, each sidebar integrates speed controls. The Exerpeutic TF1000 Walk to Fit treadmill doesn’t have a standard, motorized incline. However, it does offer two positions of incline for the deck. The rear stabilizer bar has two settings, one that provides a horizontal walking surface, and the other that lowers the rear part of the deck providing several degrees of incline. Evidently, since the incline is not motorized, you have to adjust it manually, while the machine is not in use. The deck’s step up height is approx. 6″ (15 cm). The incline doesn’t add inches to this dimension. This being said, you can basically use the machine in any room with a ceiling that is at least 10″ (25.4 cm) higher than your own height. 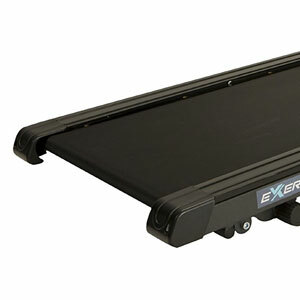 As we’ve mentioned above, the Exerpeutic TF1000 is a walking treadmill; therefore it doesn’t have an extremely powerful motor like the ones made for running. Its internal motor has a peak power of 1.5 HP. This being said, it is powerful enough to provide an optimal belt speed and functioning even if the user is close to the maximum weight capacity of 400 lbs (181 kg), without overheating or losing performance. Needless to say, since it’s a motorized machine, it requires being connected to a power source in order to start up the console and set the belt into motion. The starting speed of the belt is 0.1 MPH and the maximum speed setting is 4.0 MPH. 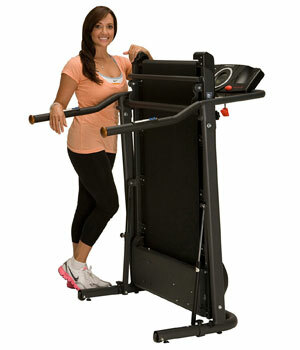 Therefore, the machine offers the possibility of power walking or even light jogging. The speed increments are 0.1 MPH. This means you can easily find the perfect pace for your workout. The speed can be adjusted from the controls on the console. However, the side handlebars also have integrated speed controls. The console doesn’t have quick speed controls, so you can’t quickly select the 4 MPH speed; you will have to press and hold one of the speed increasing buttons until the belt reaches the desired speed. The treadmill’s motor is quite silent. Also, since it’s a treadmill made for walking, your cadence on the deck won’t generate too much noise. And since the motor isn’t an extremely powerful one, you won’t have to worry about increased electricity bills even if you exercise daily. Since it’s a budget treadmill, its console isn’t extremely fancy. It doesn’t have preset programs, nor does it connect online. However, it pretty much covers all the necessary basics. 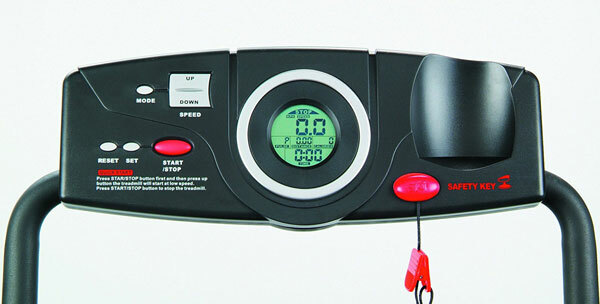 To begin with, it features an LCD display which tracks time, distance, speed, calories, and pulse. The display is divided into several sub-sections and all these workout metrics are displayed at once. Thus, you don’t have to use a SCAN function to rotate them. The speed and distance can be set into either standard or metric units. This is a plus, as many other treadmills in this price range only have a metric units setting. For pulse reading, you have to use the sensors integrated into the sidebars. The unit is not telemetric; it cannot read pulse through an HR chest strap transmitter. There also aren’t any HR-based workout programs. In other words, you cannot set up the console to adjust the belt speed according to your pulse rate. Although the console doesn’t have preset programs, it does offer goal settings for time, distance, and calories. It gives you the possibility to select a countdown value for these metrics, and if such a goal is selected for any of these metrics, it will show the remaining value up to the point to reaching zero. The machine’s console is very easy to use. Its Start/Stop button allows you to pause and resume the workout. The Set and Mode buttons are for setting the goal values. The Up/Down arrows either increase/decrease the belt speed or increase/decrease the goal values when you’re in setup mode. And finally, just as any other treadmill, the console has the magnetic safety key which is supposed to be clipped on your clothing during your workout, in order to immediately stop the belt if you fall or lose balance. This treadmill comes almost completely assembled. All you need to do is unfold it and lock the console masts in an upright position, then simply attach the console. This shouldn’t take more than 10 minutes. The manual offers pretty clear set up instructions, and an Allen wrench for calibrating the belt is included. For maintenance, the lubrication of the belt is necessary. Silicone lubricant is recommended for this. The belt should be kept clean, free of any objects that may be caught into the rollers or motor. Also, it is recommended to periodically check for loose bolts and parts. The console display doesn’t have a backlight. 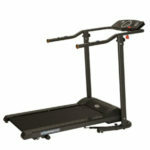 The Exerpeutic TF1000 is a heavy-duty electric walking treadmill with an impressive weight capacity of 400 lbs (181 kg). It’s equipped with a 1.5 HP motor which provides speeds up to 4.0 MPH. It has a folding design and a manual incline system with two settings. It’s an excellent machine for anyone who wants to get in shape, for light to mid-range cardio training, muscle toning, endurance development, and of course, for weight loss. It’s also not an expensive treadmill, offering an outstanding value for the price.